Weisberg points out several facts throughout the documentary such as, after 10 years, of those who start in poverty 50 percent stay there. After a divorce, in the year following a man’s standard of living increases by 10 percent while a woman’s decreases by 27 percent. An estimated 18,000 Americans die every year for lack of health insurance. Mary Venitelli is a waitress in New Jersey, which means she technically earns less than the federal minimum wage, a mere $2.18, because the tips she is supposed to make would make up for the difference. When the film opens, Venitelli has just started her divorce proceedings and appears almost too well off. She lives in a big house and drives a Volkswagen Passat, but she is about to lose both in a short while. She drives to the food pantry for Christmas gifts and food and says, “I was one of those women who used to donate to people like me.” Barbara Brooks, a child care worker in New York is a single mother of five. She earns $8.25 per hour and is trying desperately to get a degree to raise her own earning powers. Yet for every good turn in a working class American’s life, there seems to be a turn for the worse. The daughter of Reynolds, the New Jersey nurse, makes it to her 30th birthday against her doctor’s prognosis, but soon after Reynolds finds out they are being evicted. Langoria finally saves enough money to go visit his children, but five months later he loses his job. Weisberg’s Waging a Living is a brilliant portrayal of the vicious circle so many working class Americans struggle to leave. His is not political propaganda, it is a simple human interest story that should compel and inspire not only those in Washington, but all of us, to create a better society in which to live. 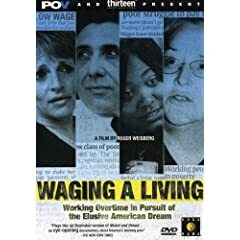 Your readers might want to know that they can watch a preview of “Waging a Living” on the P.O.V. website at pbs.org. The film premiered on PBS earlier this year. The website also features some podcast conversations with Amy Goodman from Democracy Now!, David Brancaccio from NOW and writer Barbara Ehrenreich. Thank you for the link Theresa! how would i cite this movie, APA style. I was a good friend of Mary Venitelli at Union Carbide Corporation during the 1980’s. Mary and I was on the same bowling team / league representing Union Carbide at that time. We had a lot of good times together, we lost contact when Union Carbide downsized. I would love to reach out to Mary, to let her know our freindship never died, and I would like very much to hear from her. I hope her situation has got better, for her and her three children. I want her to know, I am here for her no matter what. Mary I love you, and I see you have not changed one bit, you have a fighting spirit, and you will rise above. Please give her my email address. I HOPE TO HEAR FROM YOU!! Friend forever! !